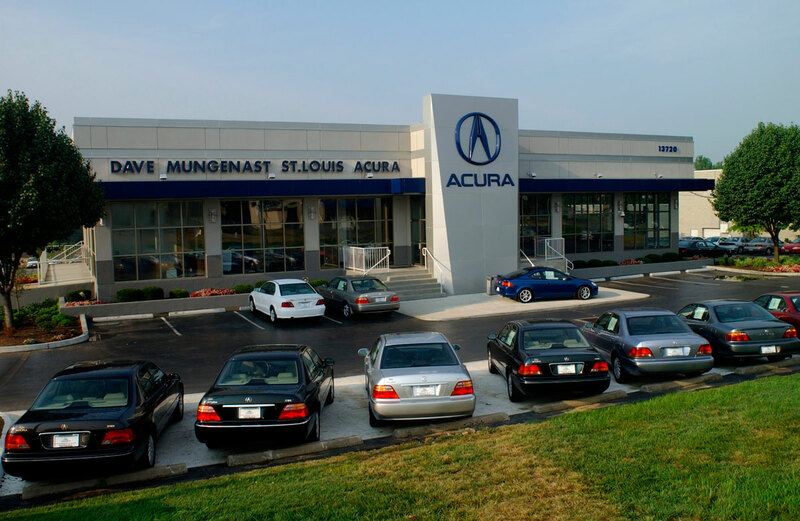 A driver on busy Manchester Road in the St. Louis suburb of Manchester, Missouri, could easily be drawn to the new Dave Mungenast St. Louis Acura dealership — in spite of many distractions. The traffic is heavy, competition from other retail outlets is intense, and a cluttered visual field requires compelling brand identification. Fortunately, the design of the dealership is compelling. 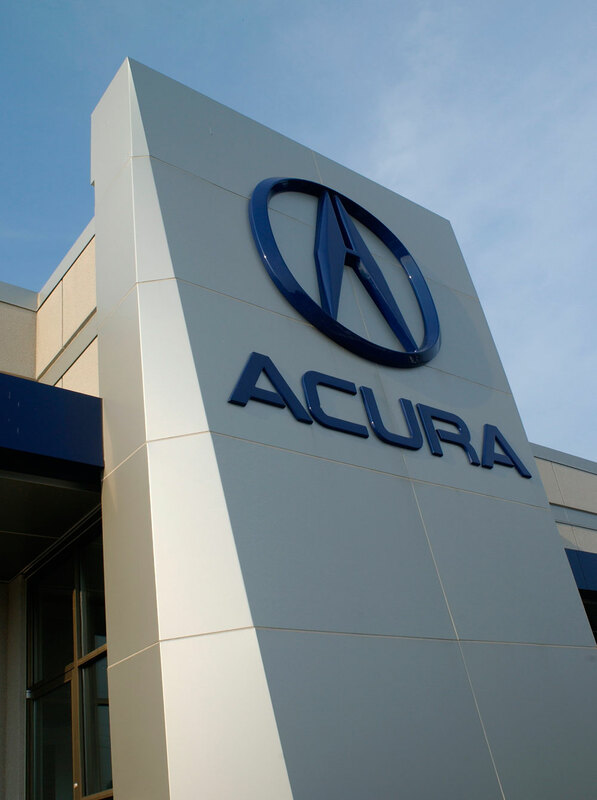 It attracts attention through placement of the Acura sign near the roadway and location of the Acura name and symbol as the focal point of the dealership building itself. The center of the building extends forward in a design compatible with the roadway signage — visually anchoring each side of the structure, while offering stairway access to the east and west wings. This prominent feature of the building utilizes Alucobond Material in Champagne Metallic XL as a field for the blue Acura symbol and name. This theme is continued on the dealership façade above through use of Alucobond Material banding. Total Alucobond Material was 4mm, with approximately 3,330 sq. ft. of Champagne Metallic XL and 1,000 sq. ft. of Acura Blue. Attachment was by the Universe 2000 attachment system. 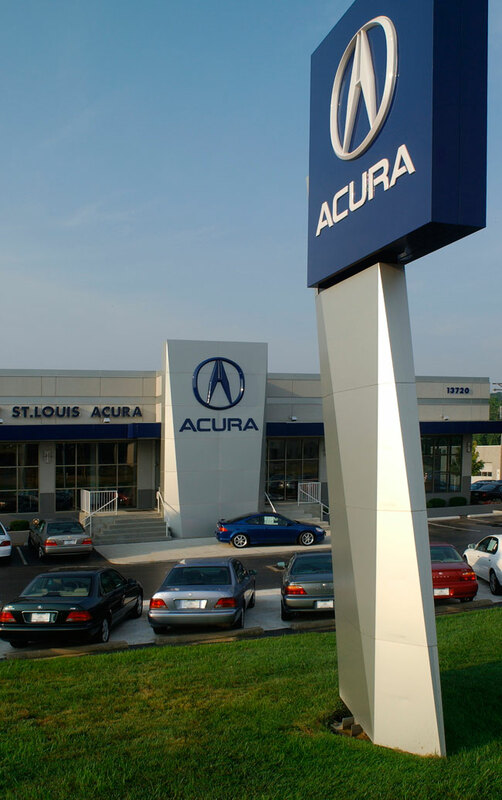 Universe Corporation of St. Louis was the engineer, fabricator and installer of the Alucobond Material for this dealership project, which was completed in early 2002. It was a design/build project by the firm of Caress-Weber, Inc. of St. Louis. A concrete apron front and center of the dealership provides a display area for featuring an Acura model of choice. The signage on the building above leaves no doubt that this is “Dave Mungenast St. Louis Acura,” with a further identification through street numbers. Even the Acura automobiles on the dealership lot are precisely aligned below the roadway signage, pointing to the dealership entrance. Nothing is left to chance, including the choice of Alucobond as the aluminum composite material. Two sheets of .020” aluminum bonded to a thermoplastic core, Alucobond Material is manufactured in the USA by the Benton, Kentucky, plant of 3A Composites USA Inc. Often, the choice of aluminum composite material in corporate identity applications like this is as much due to the image it helps convey, as it is to the properties of the material. Yet, it can be difficult to separate one from the other. This rigid, lightweight aluminum composite material not only performs well over the long term (with a minimum of maintenance), its extremely flat finish fabricates easily into the kind of “high-tech,” precision look that architects, designers, and retailers can appreciate.